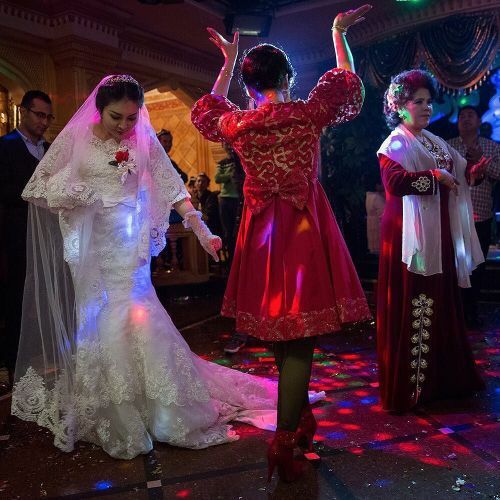 "A bride danced with guests at a traditional #Uighur wedding in Kashgar, the fabled Silk Road outpost in China's Xinjiang region. @nytimes journalists who recently took a 10-day journey across #Xinjiang found a society seething with anger as a result of a series of unprecedented measures aimed at shaping the behavior and beliefs of China's 10 million Uighurs, a Turkic-speaking Muslim minority that considers this region its homeland. Among other politices, the Chinese government has begun to offer cash and housing subsidies to encourage intermarriage between Uighurs and Hans, the country's ethnic majority. @adamjdean photographed the wedding and life in #Kashgar while on #nytassignment. To see more of his photos, visit the link in our profile." By nytimes on Instagram.